The gentle purr of the diesel engine of the Oromocto River Valley Snowmobile Club groomer becomes a roar once volunteer Blaine Smith puts his foot on the pedal. The gentle purr of the diesel engine becomes a roar once Blaine Smith puts his foot on the pedal of his snowmobile club's trail groomer. A member of the Oromocto River Valley Snowmobile Club, Smith figures he's been grooming trails for 20 years but admits he's lost count. "Been a long time," he said. When he started grooming, the machines used for smoothing and maintaining snowmobile trails weren't nearly as advanced as they are now. Where early groomers were as simple as a snowmobile dragging lengths of chain, today's four-tracked behemoth with the heated cabin and CD player is luxurious. 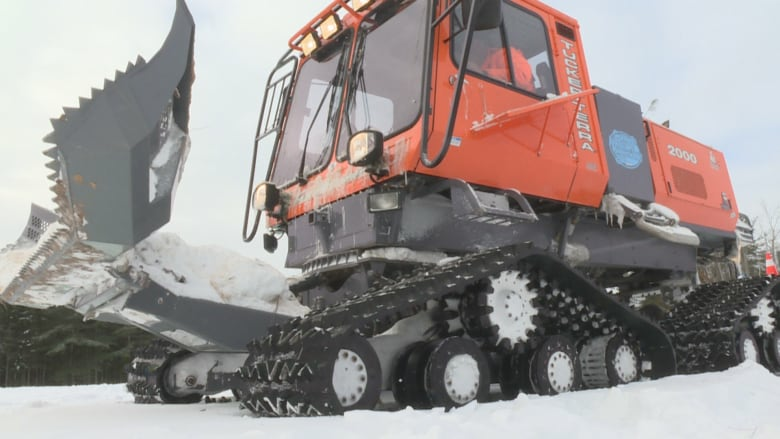 It lugs a large blue sled behind it equipped with a series of hydraulic blades and plows used to shave down and smooth out the trail behind it. But despite the technological advances, Smith still spends hundreds of hours each winter combing sections of wilderness highways. "Passion of snowmobiling, I guess," he said. "But I don't do much snowmobiling, I do more grooming than snowmobiling. I just like doing it." Smith is one of dozens who donate their time to slowly comb the wilderness highways for other snowmobilers. The grooming job is often done in the dead of night to allow for the smoothed trails to freeze in place. It doesn't pay and can often be hazardous. If the massive bulldozer-like machine breaks down or tips over, the operator can be hundreds of kilometres away from the nearest community. Sometimes that's outside of cell range. But while Smith's efforts often go unnoticed by the general public, and even other snowmobilers, the overall network of trail maintenance is recognized internationally. "I can tell you when I sit at meetings, Canadian meetings, and we're at congress meetings with the Americans, they are amazed at what New Brunswick does," said Brad Mann, the president of the New Brunswick Federation of Snowmobile Clubs. "When you talk about the snowmobile business, we're number four in the world, for organized snowmobiling in New Brunswick." Mann said that too often people criticize or don't appreciate the work of the groomers, a name shared by both the machines used to curate the trails and the people who run them. "It doesn't matter that we groomed the day before and 600 sleds went over the trail," said Mann. "The amount of mileage that is put on over these trails it's pretty much impossible, you'd have to run a groomer 24/7 to keep up and have these trails perfect every day." The New Brunswick Federation of Snowmobile Clubs is a collective of local clubs working together to build and maintain a provincewide network of around 8,000 kilometres of trails. A pass permitting a snowmobile to use the network costs between $180 and $255 for newer snowmobiles a year with some of that money going to maintain and fuel groomers. "And a lot of consumers that buy the pass don't realize how much work goes into this," Mann said. It costs about $500 to fill the tank of Smith's groomer. He sometimes gets a discount on his trail pass for his efforts, and when he takes a pit-stop at a nearby Tim Hortons, he won't turn down a doughnut from those who do thank him for his work. Despite the countless hours of work, there are still encounters with people who can easily destroy a freshly groomed trail. "With four-wheelers, that problem is looking better," said Robin Smith the president of the Oromocto River Valley Snowmobile Club who also happens to be Blaine Smith's son. "But they're still out there." Smith said all-terrain vehicles, or ATVs, tend to shred groomed snowmobile trails with tires that cut into the snow-packed trail, unlike the track of a snowmobile, which tends to sit on top of it. "They think it doesn't hurt it, but those ruts they hurt it, and you have to get right back out to fix it up," he said. "But I must admit in the last three or four years that's gotten better. "They're sticking to their own trails. They know where their winter trails are, and they tend to stay off ours."